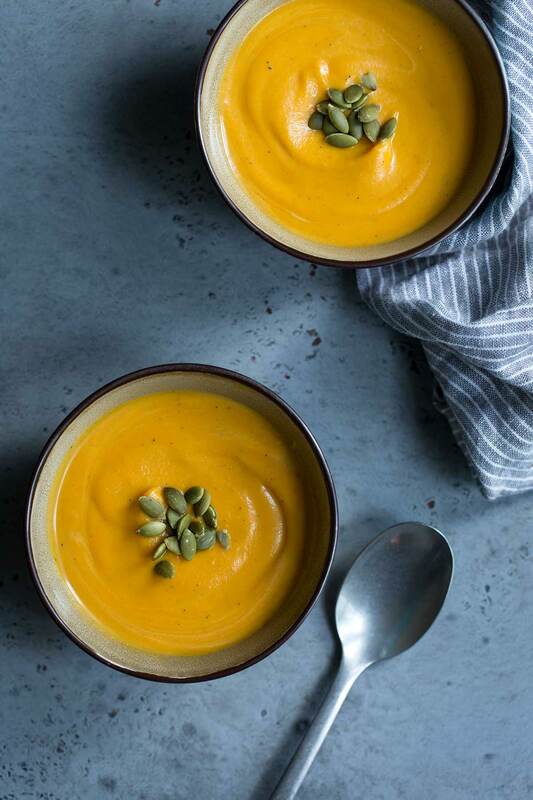 Sweet potatoes, onions, carrots, a tart apple, and warming seasonal spices make this a wonderful soup for cozy fall evenings. Serve it with fresh bread, or add some texture with toppings like toasted pumpkin seeds or pecans. 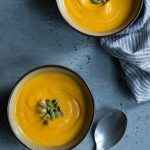 While I prefer using chicken stock for added richness, this sweet potato soup can easily be made vegetarian or even vegan with a few simple adjustments. Because of their widespread availability, I use sweet potatoes throughout the year. This sweet potato, apple and avocado salad is one of my favorite recipes. However, their peak season is fall through winter. There are hundreds of varieties of sweet potatoes, and this is when you’ll find the most options available. If you don’t mind peeling a few vegetables, this recipe isn’t difficult to prepare. When compared with butternut squash and pumpkin, sweet potatoes are much faster to work with because they’re smaller, evenly shaped, and don’t have seeds to scoop. The great thing about soup is that you can be more relaxed about the ingredient quantities. I’ve listed both weight and volume approximations, but don’t make yourself crazy trying to be perfect. Cooking isn’t an exact science the same way baking is; you don’t have to throw away an extra 1/4 cup of chopped onions or worry if you’re short 1/2 cup of sweet potatoes. Aim to get close to the amounts listed. This soup will continue to thicken as it cools down. Also, I like my squash soups on the thicker side. You can thin it out by adding some extra cream or stock, but keep in mind that it’s easier to add than to subtract. Go slow and taste frequently. Too much additional liquid and you might dilute the other flavors. Speaking of diluting the flavors, I’ve noticed that (with a few exceptions like gazpacho) many soups seem to lose some of their seasoning potency overnight. If leftovers seem like they’re missing something the next day, add a bit of salt and the other spices. Once again, it’s easier to add than to subtract. Try topping the soup with my spiced candied pecans. Toasted pumpkin seeds are another good option! See my notes in the recipe card on how to modify this recipe for a vegan sweet potato soup. Love sweet potatoes? You should also check out my sweet potato biscuits as well as my apple, sweet potato and bacon turnovers! I also love these sweet potato whoopie pies from Baking a Moment. 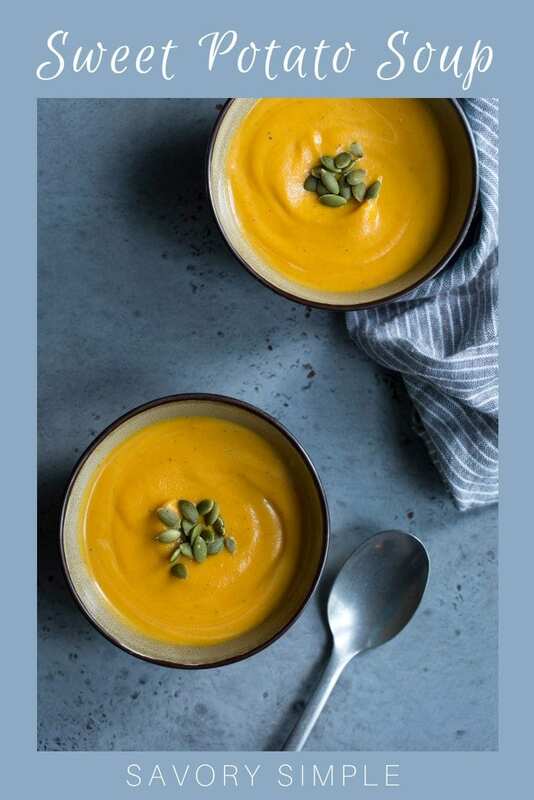 This hearty sweet potato soup is a wonderful treat for fall and winter! Onions, carrots, tart apples and seasonal spices round out the flavors. Add the olive oil to a large Dutch oven or heavy bottom saucepan set over medium-low heat. Have a small liquid measuring cup of water nearby. Once the oil has warmed up, add the onions along with a pinch of salt. Cook for 3 minutes, stirring. Add the sweet potatoes, carrots, and apple, adjust the heat to medium, and cook for an additional 10 minutes, stirring periodically. To infuse flavor into the soup, you’ll want to “deglaze” the pan 2-3 times. As a brown layer of caramelization forms on the bottom of the pan, add a small drizzle of water, about 1-2 tablespoons, and use a spatula to scrape up the brown bits, stirring them back into the soup. If no glaze appears after a few minutes, turn the heat up to medium-high. After 10 minutes of stirring and deglazing, add the stock, cinnamon, allspice, and cayenne, then turn the heat up to high. Bring the soup to a boil, then reduce the heat to low. Give the soup a stir, and cover the pot, leaving the lid slightly ajar so steam can escape. Let the soup simmer for 20 minutes. Remove the soup from the heat and allow to cool for a few minutes, then puree in a blender or food processor in batches. An immersion blender will also work, but the soup won’t be quite as silky. Return the soup to the pot and stir in the cream, salt and pepper. Taste and adjust seasonings if desired. If you want to thin out the soup, you can add some additional cream, milk or stock (try not to add too much or it might dilute the other flavors). Leftovers will keep in an airtight container in the refrigerator for up to one week. They can also be frozen for up to three months. Heavy cream substitutions and notes: For a soup that's lower in fat and calories, you can use half-and-half, whole milk, 2%, etc. You can also make a vegan soup using options like soy milk or coconut milk. Keep in mind that fat equals flavor, so lower fat and calorie options won't have the same richness. You can always add some extra fall spices like cinnamon and nutmeg to try and ramp up the flavor. 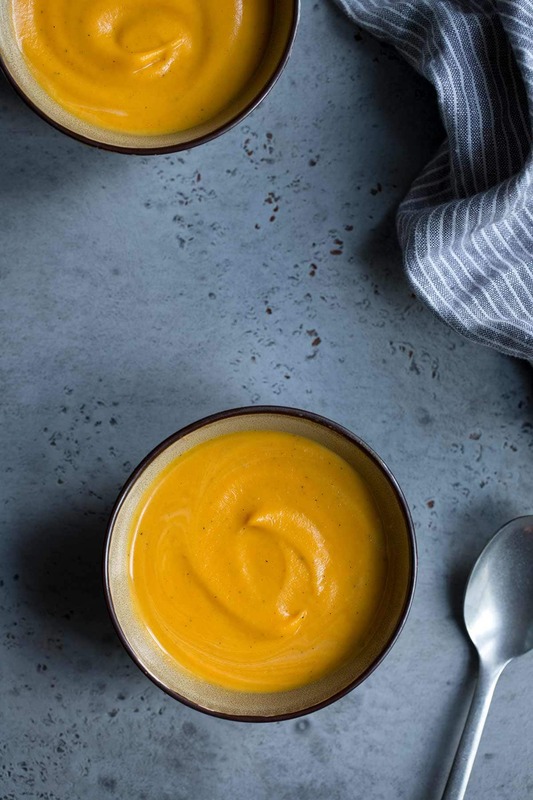 This soup is perfect and has the most dreamy texture! Such an amazing texture, and great flavor too. 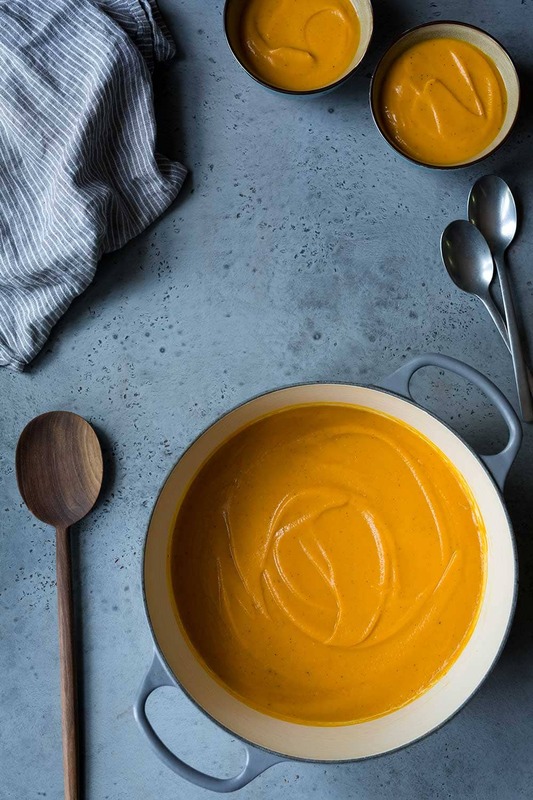 This soup looks incredible and so perfect! This will quickly become a favorite this fall! Ohh sweet potato soup is my favorite in the crisp cool fall weather. So warm and comforting. I love the idea of garnishing with pepitas! Hey! this recipe is lit! wanted to ask tho… u put calories for how many servings, or it’s for 100gr?